Box has some good features, and it’s easy to use. But conversely, it won’t sync flexibly and seems wedded to an older way of using Cloud storage that many competitors have long abandoned. Historically, Box was one of the first cloud storage solutions to market back in 2005, alongside Dropbox. The Box.net software was originally the college project of Aaron Levie, who became the companies first CEO when it became commercialised. Since then California-based Box has grown substantially and became US stock market quoted in 2015. But, what of the Box flagship product? Is it still a friendly and effective tool that attracted customers in the first place? Box operates across a range of platforms, so almost irrespective of your particular needs it has you covered for Cloud storage. Desktop computer users can download Box Drive for Windows or Box Notes for Mac, and mobile apps are also available for Android, Apple iOS and even Blackberry. Once the desktop tool is installed on a computer, it creates a subfolder to the user-defined hierarchy called ‘Box’, and anything that is placed in there will sync with the Cloud service. What this doesn’t easily allow is for you to target specific folders across the computer, as they need to be copied to the Box structure to be secured online. For those Windows users wondering the Box sync routine ignores shortcuts and also symbolic links if you have the skills to create those. The only way around we found around this is to use a Directory Junction, if you understand the MKLINK command line function to achieve this. And, until relatively recently that was what Box offered, but its now got another application that you need to install called ‘Box Sync’ that allows you to turn the sync on and off on a per folder basis. For added confusion, it also creates a new Box subfolder, this time called Box Sync. With two apps installed, neither of which do what most users need, we began to wonder exactly who, if anyone, is in control of product development? Oddly, Box sync has the capability of forcing a folder on the Cloud to be synced to the PC, but not the other way around! The way this has played out reminds us a boss we once had who if he were presented with a reality that he didn’t care for, he would assume he’d heard the information wrongly. The inability of Box developers to accept how most users want to use their computers is probably the biggest issue facing this product going forward. Unfortunately, this issue overshadows some nice things the Box development team has done in respect of using this tool in innovative ways. For computer users, Box is just a subfolder that gets copied to the Cloud or an elegant Web portal that they can access and share files using. However, Box did also include a small workflow system called Box Notes that allows you to create calendars, project plans and a few other shared documents to keep others on track. It’s not a replacement for Google Docs, or installed document and time management tools, but it’s useful for those that have very little in the way of applications. 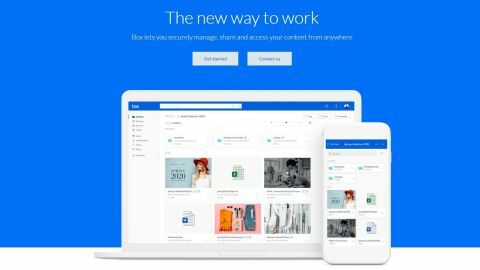 For users of Microsoft Office 365, they’ll also find that Box interfaces neatly to their office suite, expanding further the possibilities for those who use Box and not the 1TB of free space that many get for free with that product. That you can define collaborators is good, although it would be even better if Box allows multiple users to access a document at the same time. And, implemented block level updates to enhance the overall speed of synchronisation. What we did like was that box is aware if you use Google or Microsoft Office, and while in the web interface you can hit the new button and ask to create a blank Word Doc, Powerpoint Presentation, Excel spreadsheet, Google Doc or Google Sheet directly into the Cloud space. And, will then open the document in the appropriate online editor. The security on Box by default is minimalist, as like many other Cloud providers, 256-bit SSL encryption in both transfer and storage is a paid ‘Premium Security Option’. That said, all file transfers, logins and even box application installations are tracked and logged, and if you add the full Admin console, you get even greater auditing and control options. Should a file or folder be accessed, you can be informed by email, so that when someone says they read your report, you’ll know that they're being less than truthful. Where the shine of the Box implementation starts to look less inviting is when you look at the pricing, especially when compared to its biggest competitors. Box offers four plans, one of them being for personal use and the other three are for business teams. The Personal Pro plan is $11.50 (£8) per month and only gives you 100GB of storage with a maximum file size of 5GB. Microsoft gives you 1TB of space and Office 365 for less expense, to put that in perspective. The business orientated plans are branded as ‘Starter’, ‘Business’, ‘Business Plus’ and ‘Enterprise’. The pricing for these is $5.80 (£4), $11.50 (£12), $17.30 (£20), and quoted respectively, per user per month. Starter gives you 100GB, although a file size limit of just 2GB, where Business offers you ‘unlimited storage’ and a maximum of 5GB files, though you must have a minimum of three users. The Business Plus justifies its greater price by allowing unlimited external collaborators, along with Admin and Help Desk functionality for internal company support. Enterprise provides workflow automation, allowing documents to move smoothly around a company for approval or oversight purposes. For business users Box also has one-off starter packages that include training for one admin and ten users, should you feel that’s necessary. The free tier has no file versioning, where the paid have progressively more the higher up the ladder you go. Personal Pro keeps ten versions of any file, where Enterprise can keep a hundred file revisions. How ‘unlimited’ the amount of space you can use is we’ve no effective way to test, but you could certainly storage plenty of data on Box for a relatively small outlay if you have a wide enough broadband connection to send it up and recover it back smartly in the event of a disaster. The takeaway from this pricing model is that Box doesn’t much care for personal users, and instead wants big business contracts where everyone in a business is signed up on a monthly contract. Pricing in the US and elsewhere doesn’t seem uniformly adjusted, with some tiers advantaging American customers, and others more keenly priced outside that region. Unless they work in accounts, most business users will be unmoved by the cost implications of using this solution over others, as long as it’s reliable, secure and easy to use. What might be a harder sell is the lack of a flexible sync model and the file size limitations.